Maoh is another series I discovered with my Utopian Studies glasses on, something which I am quite pleased about. 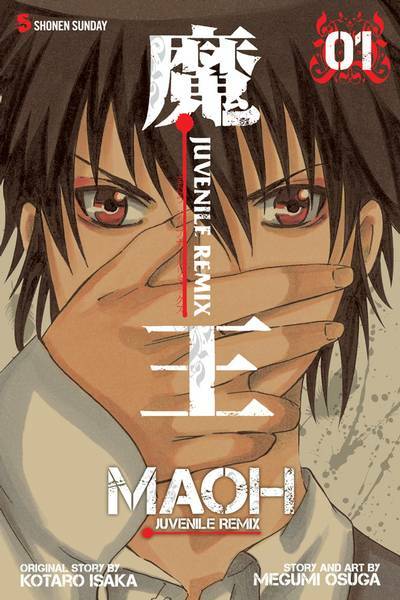 Of the three manga titles I picked up at MegaCon (Utopia’s Avenger and Library Wars are the others), Maoh is the most complex and interesting, delving deep into the dark recesses of citizen-based justice, bullying, and self-identity, all within the first volume. If one were to focus on the strongest aspect of Osuga’s adaptation of Isaka’s story, it would have to be characterization. Ando is both a sympathetic character and an intriguing one. Seeing the changing city of Nekota through his eyes provides a unique, almost anti-heroic perspective through which the major developments of the book can be consumed (M.A.O.H., as it turns out, stands for “minor acts of heroism”). It is through that perspective that one begins to understand the intricacies of what is going on and its implications. As Inukai gains more power, Ando grows more weary and concerned, both about his wellbeing and the wellbeing of the city and its citizens, both of which force him to reevaluate his world view and his rules for engagement (i.e. rules that he has written to keep his “weirdness” away from prying eyes). The development of Ando’s character, as such, presents itself in a kind of complex of character interactions. Instead of reducing Maoh to a simple-minded and overly direct narrative of self-discovery (such as one which hinges on increasing a character’s power), Osuga has created a narrative which plays out through numerous subplots. Ando’s interactions with a fellow classmate (who has become a member of Grasshopper and begun beating or attempting to kill off the bullies in their school), for example, direct him to consider how he has contributed to the conditions of a hierarchical class system in their high school and the morality of vigilante justice. Both weigh heavily on his conscience, but the storyline isn’t resolved in the first volume precisely because this is tied into the larger narrative of Inukai’s rise to power, which Ando knows is based on a morally ambiguous set of violent actions. A similar activity is present in Ando’s attempts to understand his relatively low-key magic. While Ando does have the ability to make others say what he is thinking, it is not a skill he is particular good at (having just discovered it), nor a skill which he is inclined to let others know about. His ability, then, plays an active role in his development as a character, forcing him to reshape his perspective on his life and consider the ramifications of his attempts to build an unexceptional persona for himself, in much the same way as his murderous classmate has raised similar questions. His use of his ability also escalates as he becomes more confident, acting as a kind of barometer. Ando’s magic and interactions with classmates are only two of the many ways Osuga sets up a multi-volume journey through a dislocated youth’s self-discovery. These narrative strands present themselves in Ando’s relationship with his brother, his interactions with seemingly random characters in the city (who might make appearances later), and even in his disconnected interactions with Inukai (whom he never meets, but sees in action on a number of occasions, good and bad). I think it is fair to remark that Inukai’s increased authority in the story is a little rushed, but pacing in manga is sometimes faster than in other forms of literature, in part because manga is often serialized by chapter. Regardless, the treatment of Ando’s character makes for a story that is gripping and challenging. The only serious flaw in Maoh, however, is in its out-of-place family-based humor. In any other narrative, I might have found the silliness of Ando’s brother and his brother’s girlfriend amusing; many jokes are had at their expense (the brother because he can’t cook and is somewhat lazy, and the girlfriend because she is portrayed as exceptionally dimwitted). But the serious tone of Maoh means that such moments are always sucking something away from a tension that needs to be there for the darker aspects of the narrative to hit their stride. I hope that future volumes either pull back on this kind of humor or find more appropriate ways to insert humor into the story. There is always room for humor in a serious tale, but it always comes down to timing. Here, I think the silliness of the humor detracts from an intense narrative, though only slightly, since such moments were few and far between. Despite the above flaw, I think the first volume is a fantastic read. Fans of Anthony Burgess might find Osuga’s story intriguing, while manga readers may be drawn to the subtlety of the narrative. If you’re not a manga fan, you might give this one a shot. If not, then you’re missing out. Maoh is complex and a tad sadistic, which all the best manga and anime always are. To learn more about Maoh, check out the publisher’s website. You can find all volumes of this series on Amazon or anywhere else books are sold. ‹ How Important is Science Fact in Science Fiction?